Likewise the 104 is not a sealed box design, that would be an infinite baffle system driven by an active bass unit loaded by the air in the closed box. The 104 (and Calinda) is an ABR, a different variation of a reflex design where the passive radiator replaces the mass of air that would have been in the port or tube (a port or tube being a true bass reflex). In a sealed box the excursion of the bass unit increases as frequency decreases to reach system resonance. In the 104 (and Calinda) the excursion of the B200 reduces as the bass goes down to system resonance being replaced by the BD139 excursion. The 104 is sealed box design. Tapping the B200 will cause an associated movement on the passive reflector. The Calinda is bass reflex design. 104, 104aB and Calinda are both passive radiator designs. A passive radiator (PR) design approximates to a reflex (vented) box when the free air self resonance of the PR is sufficiently low, which it is, in both 104 and Calinda. A sealed box, in my book, is a closed box. Model 103 was a closed box from that same era. A PR box may look sealed in that you can't blow smoke into it , but acoustically it is a Helmholtz resonator (+) and not closed at all. The correct term is bass radiator, yes indeed. 104 and Calinda all use the BD139 to augment the bass. They are certainly not ported. I did run the KEF 104 with the ABR removed while servicing the speakers. And it sounded thin and miserable. This reminds me about a technique I heard about adding small lead shots as weight to the back of the ABR to 'tune' the bass. Has anyone tried this before? each BD has a mass ring added to suit the design system resonance of the cabinet volume. Provided the compliance has not changed I can't see how a different tuning can be much better than the original system design, otherwise Kef would have done it? I agree, let us not insult the KEF engineers! A good way of tuning a PR is to add layers of bituminous adhesive pads on the front and back of the diaphragm until you achieve the desired result. This damps higher diaphragm resonances and was used in some of the Celestion Ditton range in the early 70s. KEF eventually opted for a steel tube in place of what would have been the voice coil, mainly because it was much easier to produce. Steel? All the samples I have played with used aluminium rings, one just keeps on learning! A good way of tuning a PR is to add layers of bituminous adhesive pads on the front and back of the diaphragm until you achieve the desired result. Make no mistake, KEF designed speakers that were accurate and musical. 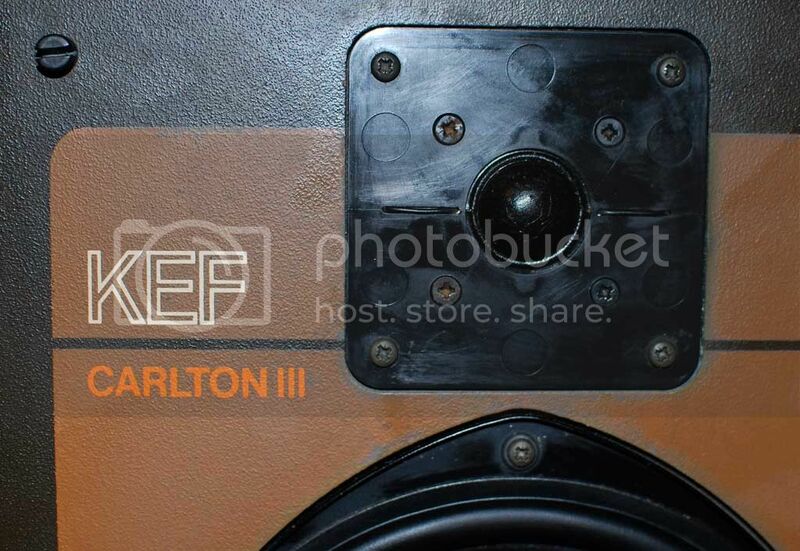 I hooked up my KEF Carlton III, which is still a thoroughbred and in stock condition, to make comparison with the modified 104. 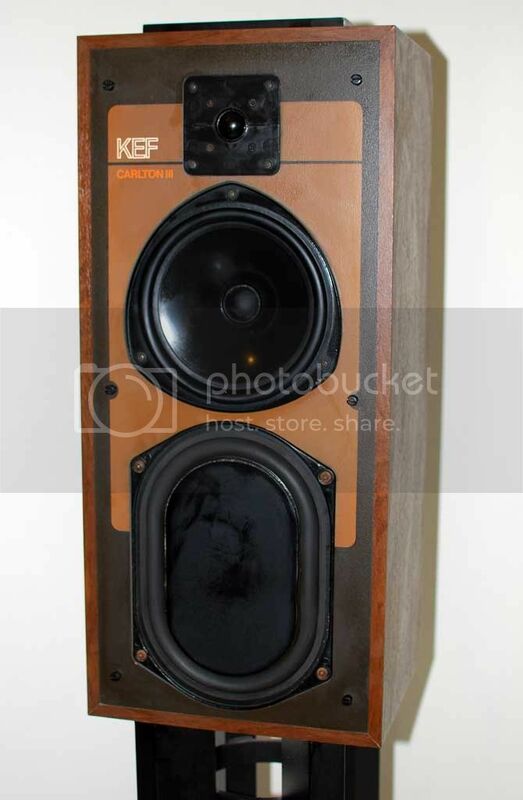 The Carlton reminds me of the design philosophy of KEF. The unmistakable English sound is back. My primary DAC is the 960, running TDA1541A S1 Crown in NOS mode. I would say that mods done on the 104 enabled it to respond to the dynamic changes of post 80s digital sources. The sound deviated significantly from the original intent, and approaches more of an American speaker's characteristic. Jazz programs has more presence and attack, which may not be to the liking of certain people. Sonus Faber used a unique? Method of tuning the KEF B139 or later TDL 3021GT03 drivers (used as ABR) resistors could be switched across the voice coil. I thing that there is a scandinavian manufacturer with ABRs which utilise screw on masses for the ABR for fine tuning. Surely sticking on pads makes the process almost irreversible? Many years ago I replaced all the caps in my 105s. Many were far from the printed value, but all were matched to better than 1% between channels, thus this was deliberate. This is because Kef selected caps into 1% bands by measurement, and then used high and low values to balance each set of drivers to give the computer predicted flat response and channel matching. Thus the design or actual value leaving the factory may be some way off from the printed value on the capacitor. The inductors were wound to suit the capacitors on the reference series. I used polyprops and polyesters, and these have much less internal resistance than reversible electrolytics so need low value resistors added to the circuit to compensate for the different dissipation factor, otherwise the sound will be unbalanced. So I measured and replaced the caps to better than 0.25% tolerance to the originals and added 0.5 to 0.8 ohm resistors to compensate. So when people swap with "audiophile caps" of the same printed value it is no wonder they sound different because in the great majority of cases the frequency response will change and have an freq peak or trough caused by a not quite right value, or a different freq response due to a difference in circuit damping. I find this reading very interesting. Are your memories fresh enough to comment on the improvements the new capacitors brought ? (or did not). Because a recent comparison with recently restored loudspeakers made me realize that there was room for improvement (my 105s lack pinpoint imaging compared to these speakers) I am wondering about crossover restoration and cannot decide to swap caps with fresher ones, particularly when I read this "The inductors were wound to suit the capacitors on the reference series." which means that replacing the electrolytic capacitors would imply a mismatch with the existing inductors. That alone sounds like a big no go to me. the main improvement was in imaging and particularly depth of image, but image sharpness also gave the impression of more detail, with a "blacker" silence. At the time bi-wiring was pretty new, and articles described putting passive crossovers at the amp terminals to reduce speaker cable effects considerably. So I triwired the crossovers and had just 0.5m of cable from crossover to the "star" connections at amp terminals, and 3-4m from crossovers to drivers. Being young and enthusiastic I even ran separate cables for the led circuit. I kept the 360uF series caps on my samples made up of parallel 30uF polyprops and smaller padding caps. At first I did not add resistors but had an amp with tone controls at the time and a slight shelf of +2dB in the bass and -2dB in the treble gave a very well balanced result with plenty of detail without losing bass and low mid presence. Later I added some power resistors to the crossovers to play "flat". Thanks for the input, that's quite an encouragement to proceed. I'll meticulously measure both corssovers before modifying any part of them. I reckon only the capacitors present on the signal path are worth swapping ?